In October of 2003, playing in front of red ivy and screaming fans, the Cubs were five meager outs away from reaching the World Series with the future of their franchise, Mark Prior, on the mound and sailing along. And then, the bottom fell out. The Cubs watched their opponent, the Marlins, beat the Yankees in the 2003 World Series and had to settle for being a preseason pick for the 2004 Series. That's right, the Cubs, who haven't won the pennant since 1945, a World Series since 1908, or even had consecutive winning seasons since the years 1970-1972, were a favorite to reach the World Goddamn Series. 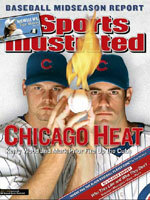 Apparently no one warned pitchers Kerry Wood and Mark Prior about the Sports Illustrated cover curse, which seems now only slightly less powerful than that of the billy goat. Hell's weather report, October 3: Still very hot. To sum up: 1 cover + 2 pitchers = 22 starts missed. Couldn't someone have warned them? Injuries, baserunning blunders, defensive lapses, and a curious aversion to clutch hitting have all combined to dull the spring training luster of this team. The team that looked convincing on paper has consistently proved that games are won on the field, not on paper. The Cubs finished the 2004 season with a 3-7 finish to their schedule that was, on paper, the easiest schedule of any contender for the wild card. Instead, a weary Cubs team that played 26 games in the final 24 days of the season saw both the Astros and the Giants blow right past them. Cubs fans across the country have found that the only disappointment greater than having an overachieving team blow a 3-1 lead in the NLCS is having an underachieving team that doesn't even get to the playoffs. How does such a thing happen? The answer, my friend, is collective stupidity. The Cubs entered August in the thick of the National League wild card race, despite the collective stupidity exhibited by the players in the field. It's said that baseball is the ultimate game of numbers. One of the numeric aphorisms about the game is that nearly every team can count on winning a third of its games and losing a third of its games during the season; it's what the team does with that tricky middle third of their games that determines its fate. That's 54 games to win or lose. So, if we look back to how the Cubs played in relation to their collective stupidity over the final 54 games, it is possible to gain some insight into a more-than-mildly disappointing season. I've termed this rating system the Collective Stupidity Index (CSI). The absolute best one could hope for under these circumstances was 96 wins, which one would think should be enough to sew up a wild card berth. Back on August 5, the Cubs win percentage was .556, which projected them to win 90 games for an overall record of 90-72, 18 games over .500 and having back-to-back winning seasons since the 1970s. Not a bad accomplishmentnor much to ask for, given the talent (notwithstanding the collective stupidity) of the 2004 Cubs team. Even without a wild card berth, that would have been something to write home about, as the Cubs have won 90+ games a grand total of four times in the 59 years since they last took the pennant. However, this has proved only that God created the Cubs as either a cruel joke or an eternal lesson in humility. After the plethora of injuries; after spats with fans, umpires, the media, and their own broadcasters; after enduring cold streaks of Ice Age porportions; the Cubs finished short of the playoffs. While the Cardinals, picked to finish third or lower in their division, closed the 2004 campaign with the best record in baseball (105-57), the Cubs, picked by many to win their division and the World Series, wound up watching the playoffs just like the rest of us: on television. Frankly, the Cubs played pretty much to their level of collective stupidity while the Astros and Giants played above theirs. The above numbers sum up the situation as it unfolded over the last third of the season. The Cubs, who led the Giants by three games and the Astros by six on August 5, saw these teams pass them by at the end. Their season, as it turns out, was dictated by two improbable runs: the St. Louis Cardinals having their best season in 60 years, and the Astros having the best stretch run I can remember in a long time, playing better than .700 baseball over the last two months of the season. And despite all that, it took until the 161st game for the Cubs to be eliminated from playoff contention. When the final standings were tallied, the Cubs ended up three games behind the Astros and two games behind the Giants on the leader board. Those numbers don't really do the Cubs justice, however; this season consisted of a small number of pivotal moments where the Cubs had the initiative and lost it, and that's how a season becomes a disappointment. Carlos Zambrano squares off in St. Louis against Matt Morris. After managing a meager five hitsand only two runners in scoring positionover ten innings, the Cubs go to the bottom of the 10th in a scoreless game. Cubs reliever Kyle Farnsworth walks the first batter, gets an out on a sacrifice bunt, then walks the bases loaded to set the stage for Scott Rolen's game-winning single. Cubs lose to the Cardinals 1-0. On the heels of losing a two-game set in Houston, the Cubs pull into Pittsburgh for a doubleheader. Pirates outfielder Rob Mackowiak becomes a one-man wrecking crew the same day he becomes a father. In the first game, Michael Barret hits a pinch-hit grand slam to give the Cubs a 5-4 lead in the seventh inning. Cubs closer Joe Borowski allows a leadoff triple in the bottom of the ninth, followed by a game-tying single. Two more hits and a walk later, the bases are loaded with two outs for Mackowiak, who is 0-4 with two strikeouts at the time. Mackowiak takes a 2-1 pitch over the right field wall for a grand slam; Pirates take the first game 9-5. Cut to the second game. The Cubs take a 4-2 lead into the ninth inning. Cubs reliever LaTroy Hawkins ushers a leadoff walk to Tike Redman. Mackowiak steps up to the plate and drives the first pitch he sees over the right field wall to tie the game. One inning later, Cubs reliever Francis Beltran fires in a first pitch that Craig Wilson drives out of PNC Park. Cubs lose to the Pirates 5-4 in a doubleheader sweep. The Cubs enter the day one game back in the division to the Cardinals. Cubs starter Glendon Rusch gives up five runs over five innings, but the Cubs take a 9-5 lead into the bottom of the sixth. The Cardinals proceed to score three runs in their frame, followed by runs in the seventh and eighth innings. Cardinals outfielder So Taguchi scores the go-ahead run on a Paul Bako passed ball on Kyle Farnsworth's first pitch in the eighth (with two outs in the inning, of course). Cardinals lefty Steve Kline gets the win by getting the last five outs of the game without allowing a base runner; this is also a game in which Kline, expecting to get the call in the sixth inning, is shown on Fox Sports Net flipping the bird to manager Tony LaRussa from the bullpen. The net result is a 10-9 Cubs loss to the Cardinalsand the rest of a season spent looking up at the Cardinals in the standings. In Philadelphia, Phillies starter Eric Milton outduels Mark Prior by taking a no-hitter into the eighth inning. The Cubs enter the ninth trailing 2-0, but with two outs in the inning, Corey Patterson doubles home Michael Barrett and Mark Grudzielanek to tie the game. Sosa grounds out to short, and the Cubs send LaTroy Hawkins to the mound in the bottom of the ninth. Hawkins issues a leadoff walk to Jim Thome. Doug Glanville sacrifices Thome to second, and Pat Burrell takes the first pitch he sees into right field for a game-winning single. The Cubs lose to Philadelphia 3-2. Houston comes into town for the last series of the season with the Cubs. After losing the previous day to the Cubs, the Astros are 64-63 and trailing the Cubs in the standings by seven games. Cubs starter Kerry Wood is set to pitch against the Astros' Roy Oswalt for the second time in five days, and Michael Barrett, plunked by Oswalt in that game, has a few words for Oswalt when the pitcher makes his first appearance at the plate. This marks a turning point for the Astros, who chase Wood with eight runs in less than five innings. The Cubs never get closer than three runs down, as Kyle Farnsworth enters the top of the ninth and gets all three outswhile scattering six runs in the inning. After the game, Farnsworth loses a kickboxing match with an electric fan that sends him and his 5.12 ERA on the disabled list. Cubs lose to the Astros 15-7, and the Astros go on to take three out of four at Wrigley. The Cubs enter New York for a date with the Metsand the continuance of the "soft" part of their schedulecoming off a sweep of the Pirates in Pittsburgh. After taking the previous day's contest, the Cubs have a four-game win streak, a 1-½ game lead in the wild card standings, and Mark Prior going to the mound. Prior shuts out the Mets into the eighth inning, and the Cubs go to the bottom of the ninth staked to a 3-0 lead. Cubs reliever Ryan Dempster gets Todd Zeile to strike out, then walks the next two batters. In comes closer LaTroy Hawkins. Hawkins induces a fly out to right, leaving Mets runners at the corners. On a 2-2 count, Mets rookie Victor Diaz belts a three-run homer over the right field wall to tie the game at 3-3. The Cubs leave men in scoring position in their halves of the 10th and 11th innings before Cubs reliever Kent Mercker gives up a walkoff home run to Mets rookie Craig Brazell (his first career home run, no less). Cubs lose to the Mets 4-3 in extra innings and propel themselves into losing the series in New York. Mark Prior sets to take the mound as a stopper, as the lowly Reds have won two straight at Wrigley to drop the Cubs to second place in the wild card standings, a half a game in back of the Astros with four games left to play. Prior is set to face off against Reds starter Aaron Harang, who enters the day with a 5.03 ERA. Prior proceeds to pitch a masterpiece, allowing three hits and one run over nine innings while striking out sixteen. Meanwhile, Harang only gives up four hits and one run, a Sammy Sosa homer in the sixth. Unfortunately, Austin Kearns hits the foul pole for a home run the next inning, and both teams remain scoreless through 11 innings (the Cubs manage nothing against Juan Padilla and his 12.71 ERA) . In the top of the 12th inning, Kyle Farnsworth gives up a two-out, run-scoring double in the top of the inning to Reds catcher Javier Valentin. In the bottom of the 12th, the Cubs get a leadoff single from Jose Macias, a strikeout from Corey Patterson, a bunt sacrifice from Nomar Garciaparra that moves Macias to second, and a walk to Aramis Ramirez to send Moises Alou to the plateonly to end the game on a routine fly to center field. The Cubs lose their third game in a row to the Reds 2-1. In the process, they all but eliminate themselves from the wild card race by dropping five games in six days to the Mets and Reds, who are collectively, on September 30, 28 games below .500. The Cubs did not fail because of injuries. Neither did they fail because of the media, or Steve Stone and Chip Caray. The Cubs failed because they could not ultimately rise above their individual shortcomings as a team. The Cubs were a home-run powerhouse, ranking third in all of baseball for knocking the ball out of the park. That would ordinarily be a very good thing. However, the Cubs were plagued by other problems, at the plate and on the mound. When the Cubs' 2004 epitaph is written, it should note that there is much more to the game of baseball than home runs and slugging percentage. The 2004 Cubs ranked 23rd out of 30 teams in on base percentage. They also ranked 25th in walks, 23rd in stolen bases, 16th in runs scored, 15th in batting average, and 12th in strikeouts. That's a lot of empty calories; a lot of players hit the ball out of the yard without a lot of men on base. And the reliance on the long ball meant that the Cubs won all of 17 games this season in which they did not hit a home run. The team rolled its all-or-nothing dice and came up snake-eyes in the last week of the regular season. Simply speaking, when a team has baserunners, good things will happen. Conversely, any team that relies so much on putting bats on the ball to get men on base is begging for just this kind of heartbreak. The Cubs were mediocre to below-average in almost every team batting category, and they still nearly took the wild card. Just think what could have been if they had been a little more patient at the plate. Pitching, at least from the starters, was not lacking in quality. 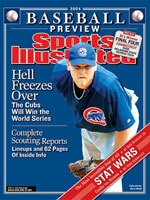 In fact, it's arguable that pitching is the one thing that allowed the Cubs to overcome their mediocrity at the plate. The Cubs led the majors in strikeouts and opponent batting average, ranked third in staff ERA, and tied for fourth in opponent on base percentage over the course of the season. Unfortunately, the Cubs staff also ranked fifth in hit batsmen, 12th in wild pitches and 14th in walks issued, so control could sometimes be a problem. The bullpen was serviceable, improving slightly in ERA and batting average against from last year, but the Cubs only blew 15 saves all of last year in 51 chances. In 2004, the bullpen blew 24 saves in 66 chances, ranking eighth in all of baseball in blown saves and 17th in overall save percentage. And LaTroy Hawkins, filling in for Joe Borowski, was 4-11 in one-run save opportunities this season, proving beyond a reasonable doubt that as a closer, Hawkins makes an excellent setup man. All the above factors came into play in the Cubs' woeful 19-30 record in one-run games this season. They only finished three games out of the wild card; it doesn't take a Mensa member to do the math there. With a four-game swing in those games alone, the Cubs are in the playoffs. That should give Cubs management something to chew on in the offseason. So, does this roster call for a scalpel or for a meat cleaver? The Cubs finished 2004 winning one more game than they did last year in winning the division. They had consecutive winning seasons for the first time in three decades. And in the face of adversity on a number of fronts, they were still the team to beat until the last week of the season. Two things absolutely have to be addressed: the Cubs are in desperate need of a closer, and the Cubs should be amenable to trade in some slugging percentage for on base percentage. If Cubs General Manager Jim Hendry manages to add that to the mix, there's no reason to believe that the Cubs won't be the team to beat for years to come. Let's just hope they're done with giving the other teams in the league any help by beating themselves.